“Art Show / Art Student” scam – “Hi, I’m an art major at a Chinese university (usually Xi’an). We are showing our work nearby and would love for you to have a look. Don’t worry, entrance is free and there’s no need to buy anything.” If you follow this “art student” you will be pressured to purchase expensive, low-grade art prints. “Tea Ceremony / English student” scam – “Hi, we are English students at a local university. Would you mind helping us practice our English? In exchange, we will treat you to a traditional Chinese tea ceremony.” After ordering tea and snacks they will excuse themselves. Moments later the bill will arrive and very large men will force you to pay an exorbitant amount of money before allowing you to leave. Real English students will not mind going to a place of your choosing for a chance to practice their English for an hour. 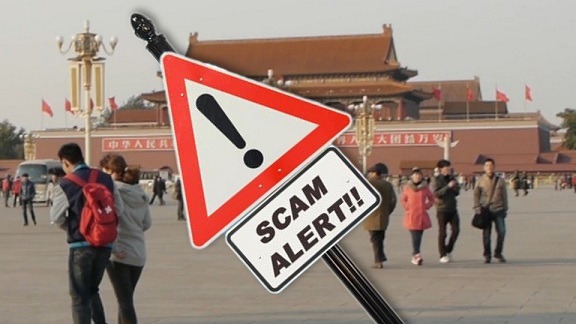 “Injured Relative / Arrested Relative” scam – “Hi, I’m a friend of your grandchild here in China and she was just seriously injured (usually in a traffic accident) and/or arrested. In order for her to receive medical care in China you must pay all fees upfront. The American Consulate won’t help. Please wire $2000 to my account so I can ensure your granddaughter receives the necessary medical treatment.” Always best to try and contact your relative directly, or call ACS to help you find out the facts, if someone tells you that they are in trouble and need you to wire them money ASAP. In China medical facilities will usually contact the U.S. Consulate if an American citizen is admitted without anyone to assist. We will never refuse to assist American citizens in need. “Please Hold the Line for the Police” – You receive a phone call from someone claiming to be from your bank or the police station and you are told that someone assumed your identity and used your credit card to commit credit card fraud, which is now under investigation by the Public Security Bureau (PSB). You are informed that the PSB requires your bank account information to complete their investigation. After providing your personally identifiable information over the phone that included your savings account information, your account is liquidated. You later find out that the person who called you was not from your bank or the police station. If you receive a call from the police asking for personal information you should ask them to wait, and contact your nearest police station to inquire into the situation in person. patient and tells you that he will hold the line while you check online or call 114 to verify the number. You check with different resources and confirm the phone number of the incoming call belongs to the police in Beijing. You then follow the caller’s instructions and provide him with detailed information about your bank accounts. You transfer the money to the safe account as instructed by the caller. You later find the money that you transferred is gone. How this Scam Works: To attract clients, telecom operators enable clients to set the incoming number they want to be displayed on the phone of someone they call. Bottom line, you cannot always trust that a phone call is truly coming from the number appearing on your phone. If you are concerned about your bank accounts, it’s best to contact your bank or the local authorities directly. “Business Deal” – You have been doing business with a Chinese company for some time and receive an email asking you to send the next wire transfer to a new account number. After wiring the money you are asked to resend the payment because it never arrived. After rewiring the payment you are again notified that the payment did not arrive and that you should try sending it to another account number. At which time you become extremely suspicious and discover the email address is slightly different from the company’s real e-mail address and/or the person who has been contacting you left the company a month before. “IRS scam” – You received an email from the IRS claiming they cannot process your recent tax return because you did not include a photocopy of your state or federal ID. The IRS does NOT generally initiate fax or emails to taxpayers, nor does the IRS discuss tax account matters with taxpayers via email or fax. Moreover, the IRS never requests security-related personal information, such as your SSN or PIN numbers. “Diversity Visa” – You receive an email congratulating you because you’ve won a Diversity Visa and although the Diversity Visa participation was free, U.S. law and regulations require every diversity visa winner to pay a visa processing fee of $819. The email goes on to state the fee must be paid using a Western Union money transfer and will be processed by the U.S. Embassy in the United Kingdom. UNDER NO CIRCUMSTANCES should money be sent to anyone to participate in the DV Lottery. The Department of State’s Kentucky Consular Center (KCC) does not send email notifications to DV entrants informing them of their winning entries. “Real Estate” scam – You sign a contract for an apartment you want to rent and hand over the deposit and first few months rent to who you believe is the landlord. Everything seems legitimate until you return home one night to discover the real landlord in the apartment demanding to know who you are and why you have moved into his apartment. You find that the person you signed the contract with has skipped town with your money and the real estate agent has no recollection of you. “Black Taxi” – “Where do you want to go?” or “Taxi?” If you get in, make no mistake, you will be grossly over charged and potentially robbed in a secluded area by the driver’s friends. The same goes for motorcycle and moped operators charging for transportation. “Fake Police” – You are stopped on the road (usually near an area frequented by expats) and asked to show your passport to a person claiming to be a police officer. When you cannot produce your passport, you are asked to pay an on-the-spot fine of RMB500. First, if they are real police they will have no problem with showing you their ID when requested. Furthermore, real police officers will go with you to their police station where you will be issued a receipt for the fine. “Pickpockets” – Typically, a single man or a pair of women with babies strapped to their chests approach you from behind during your walk near a popular tourist area (Nanjing Rd). Unbeknownst to you, they unzip your bag and quickly steal everything that looks expensive. Remember to keep your bags in front of you and do not place valuables in your back pocket. “Child Beggars and Flower Sellers” – “Money, money, money!” or “Flowers, Flowers, Flowers!” Money dropped into their cup will be taken by their adult handler (perhaps even their kidnapper) who is exploiting the child and your humanitarian nature. If you want to help, consider offering food instead. “Buy a Car” scam – A Chinese based website states you can pay 30% of the total cost of the car now through Western Union and the balance upon delivery. In the end you never receive your car or see your money again. “Black Money” – In order to prevent the theft of U.S. currency being shipped overseas, the U.S. government has a process to coat $100 bills with a special ink (usually black). I have intercepted one shipment but need your help purchasing a special solvent to “clean” the bills. I am happy to share the proceeds with you. Of course, the process is bogus, and you will lose whatever money you invest. “Stolen Wallet” – “Hi, my wife and I (dressed nicely) are tourists and had our wallets stolen. Could you please loan us RMB100? When we return home we will send you the money back.” You will not receive any money back and have just been victimized by a con artist. “Dropped Metro Card” scam – The taxi driver drops your transportation card as he attempts to hand it back to you in the backseat. The next time you go to use it you find the card has a zero balance. What happened to your money? The taxi driver saw that you had a lot of money on your card and dropped it by his feet to quickly switch it for an empty one. Circumvent this scam by placing a sticker or other clear identifying marker on your transportation card to confirm the card handed back to you is indeed your own. Shanghai is a big city with big city problems. It is not a good idea at home; it is probably not a good idea here. Always be aware of your surroundings. Look at the people close to you and watch out for “accidental” nudging and touching. Think about leaving valuable and extra cash behind in a safe place when you go out. Don’t carry all your valuable, cash, credit cards, etc in one pocket or bag – distribute. Enter into your phone: 110 (police) and 962288 (bilingual assistance, out of Shanghai, call 021-962288).